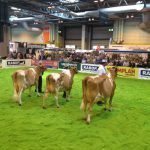 The facilities at the NEC are first class, the organisers making the effort to help exhibitors (no other show unloads the kit and moves it to the stalls) and in general the other dairy breeds are taking advantage of 10,000 dairy farmer visitors. 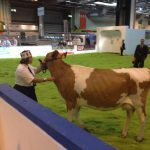 In total there were 7 exhibitors having made entries with 4 milking animals forward (1 last year) and Wiltown Claudia ,owned by James Bartlett (Hinton Farms) but bred by Brian and Sheila Adams was the Heifer in Milk Champion. 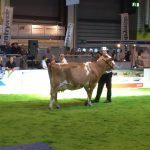 Claudia is a “sexed” Mint daughter of Aber Showtime Dancer 5 who was the first heifer to be shown by the Adam’s on behalf of the Addington Fund. Two Junior Cows found the North Somerset and Reserve Bath & West Champion Ermie and Gerties Dorcas from Hinton Farms taking on Clay Hill Dot 4 from the Dean family the 2013 Dairy Show Champion as well as South of England and Surrey show Champion in 2014, both cows were calved last autumn and it is difficult to show them to their true potential when 8 months calved ! 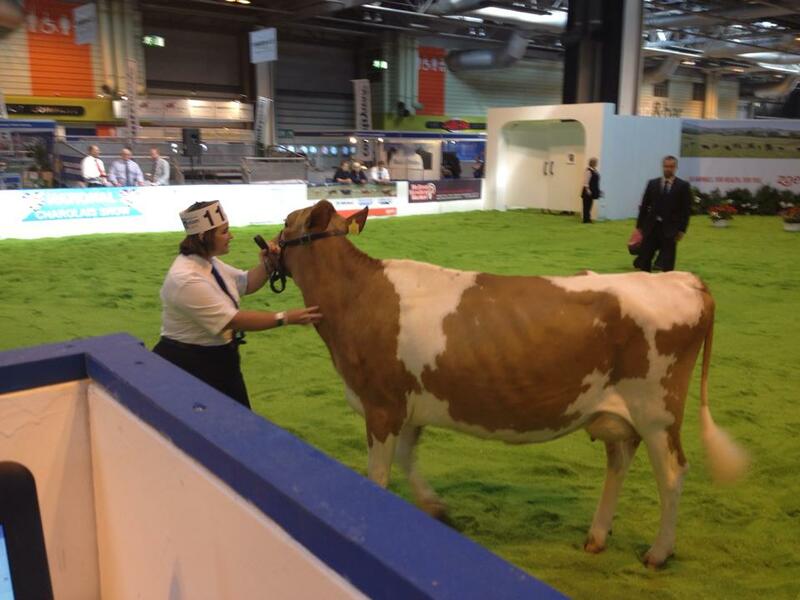 ,but David Mann placed Dorcas first for a greater capacity and height and width of rear udder. 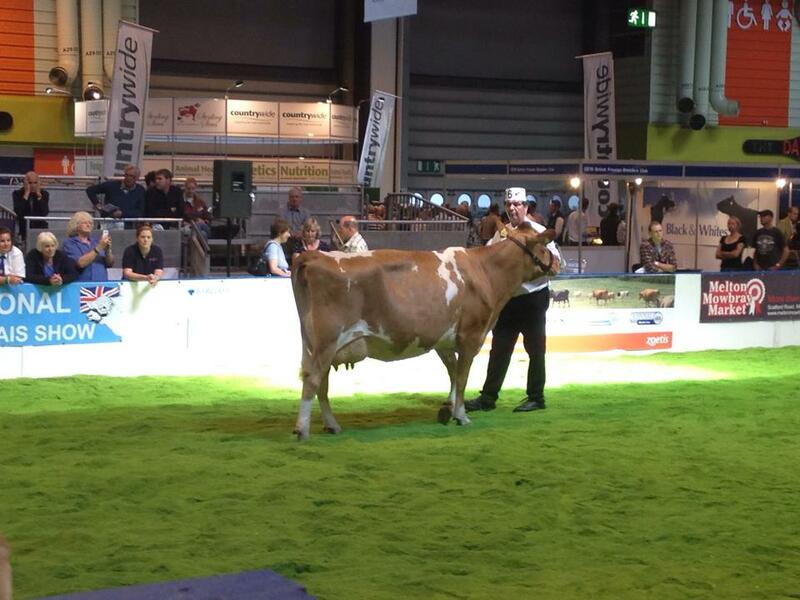 Robert Page from Sussex provided the Senior Cow with Easby Countess 8 a daughter of Easby Prince and bred by D & A Waters. David chose Dorcas as Champion and Claudia as Reserve and both will go out again today in the Inter breed Championships. 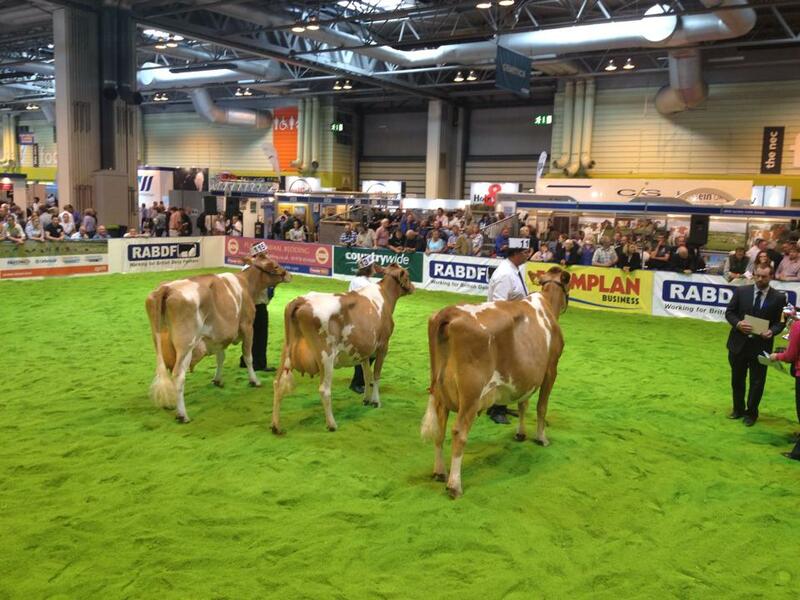 Day 2 of the Show is given over to Young Stock classes and 7 heifers will be competing. Unfortunately my camera was damaged when “hurricane” Goldstream made a brief appearance on Tuesday and whilst I will recover from my injuries the camera will not, but fortunately the organisers have a Professional on hand and so pictures of the Champion and Reserve will be available shortly. The pictures included here are from Kirsten Bevis, who was at the show reporting for RABDF to Social Media thanks to her for her help.